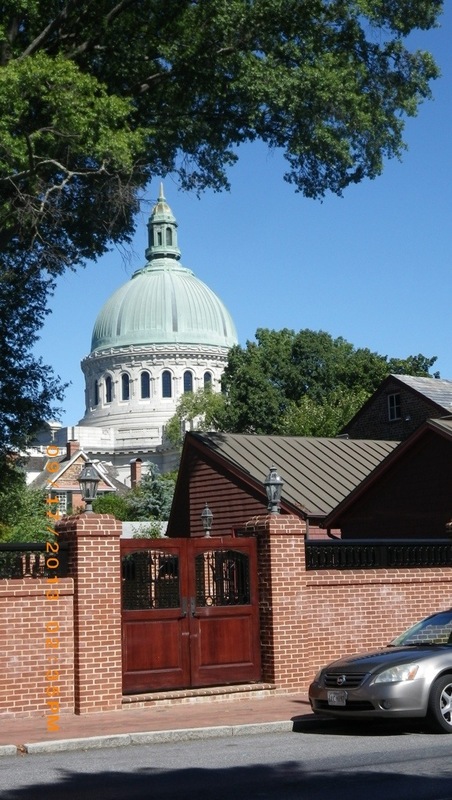 Today is the day to go to St. Michaels on the Eastern Shore of the Chesapeake Bay, As is typical for us, we woke early at 6am and castoff at 644am. We saw a beautiful sunrise which is one of the advantages of being up so early. The wind was 2.5 kts from the north and we had a .2kt negative current which changed toa positive current starting at 818am. by 843am we let out the head sail with the winds now at `1.5 kts from 152 degrees which is a broad reach. by 908mpm, the winds increased to 14.5 – 16 kts enabling us to sail when we added the Barberhaul. Being a little while since we have sailed, I took a Marazine which did the trick. Aswe were going further south, Phil was checking out the charts and noticed that the channel to Kent Narrows to take the short cut to St. Michaels read 3.5 ft deep. He made a few calls and reached a Marina who said it was deep enough to go through. Phil didn’t feel comfortable with that, wanting to make sure, so made further calls. As this was going on, the wind was clocking and we were now on a reach (much more upwind). We needed to be sure about this, as if we had to return, we would have to go dead upwind with increasing winds. NOT FUN! Finally Phil reached the Coast Guard who thought that we wouldn’t be able to make it. So we made an immediate turn and was going upwind heading for the Chesapeake Bay Bridge. at 1125am we started the engine and rolled up the head sail entering the Annapolis Harbor. Should we anchor or take a mooring ball? The winds were predicted to gust into the 20’s so we picked up a mooring ball after going through the 12 noon Bascule Bridge. By 1205pm we picked up mooring ball 48 for $25/night. We traveled 31nm GPS, 30.26nm boat getting a little boost from the current. It didn’t take too long before the Harbormaster boat came up and we paid for 2 days on the mooring ball as the wind is suppose to increase tonight and tomorrow gusting into the 20’s. We stayed on the boat for the rest of the day. I made brats, cabbage, carrots, and potatoes in the pressure cooker. We relaxed and I ripped out the socks to the toes (don’t need to redo those) and started again this time with fewer stitches and a size smaller needles. We put the engine on the dinghy and went into town to take showers and wash clothes. Here they have a washer and dryer in each of the bathrooms on the 2nd floor of the Harbormaster’s office. You get tokens for entry. In the past we had to pay for the tokens. It costs $1.50/load to wash and $1/load to dry, Very good. Talking about laundry, it’s been very good using the waterproof bags that we got from Walmart. Each 40L bag is about 1 load we have found and they stay dry in them on the way back to the boat. I can even fit my backpack into a 40L bag even though it is a tight squeeze width wise. Some photos taken during our walk. 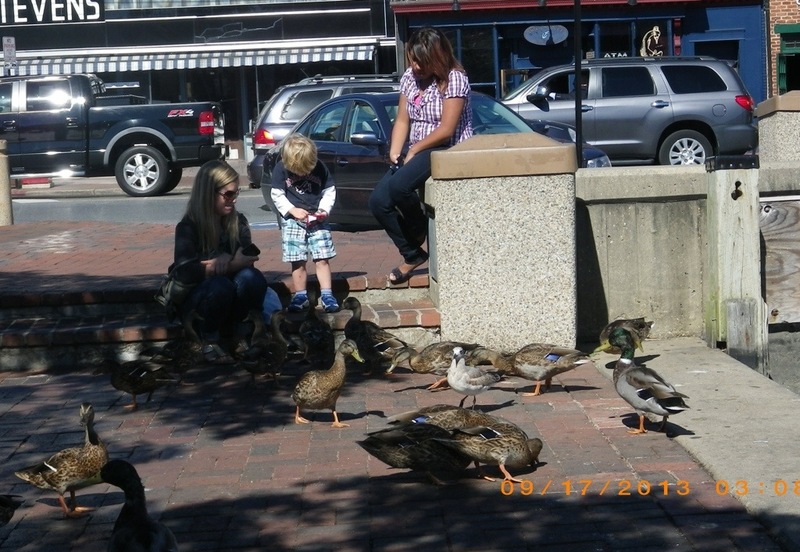 Children feeding the ducks at dinghy docks. We walked around town and then had some ice cream before returning back to the boat about 330pm after visiting a couple boats moored in the outer mooring field. One is S/V Harbor Home III a Gemini Cat. We saw them at Cape May and I wanted to chat to see if they are also going south. Cptn David and Annie are seasoned cruising surviving Hurricane Ivan in Granada. They are going to the Bahamas too, but crossing a week or two later than us. Hopefully we’ll see them again. Then we motored over to S/V Tranquility III. We wondered if we saw them in the Bahamas. They were there, but in April after we had left Chuck and Judy are from the Chesapeake Bay Area about 5 hr sail south of here. They have a IP 35 and are also talking about going south. 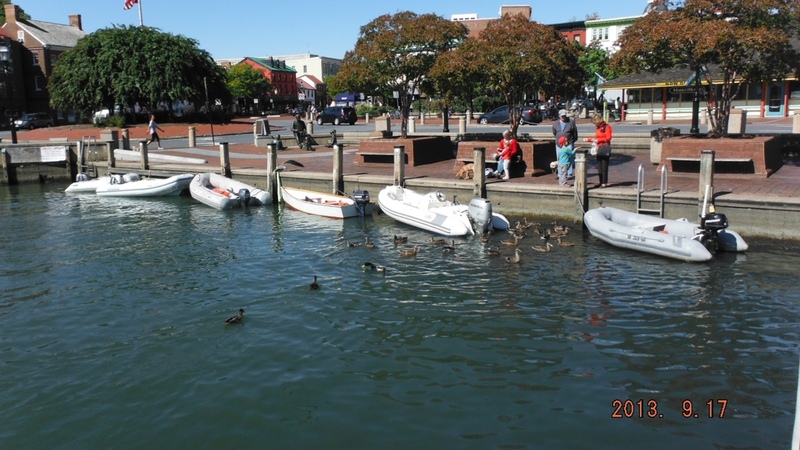 There are many mooring balls available which is unusual for us to see since every time before, we’ve been here during the Annapolis Boat Show. It’s nice to have a choice of mooring balls and Spa Creek is known for anchors dragging. After returning to Changes, we took the engine off the dinghy as we are planning on leaving for St. Michael tomorrow. 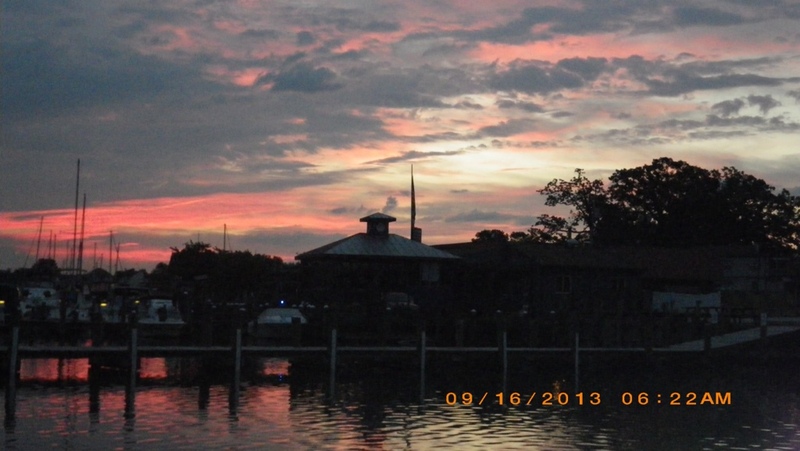 We got a call from Jack Pavesich from S/V Passage also a member of our home Grand River Yacht Club. They will arrive tomorrow. Phil told him that we were leaving tomorrow, but after we talked, we decided to stay another day as the winds are still suppose to be light Friday and we think that we can make it still to Solomon, MD. Phil called them back and they were happy. 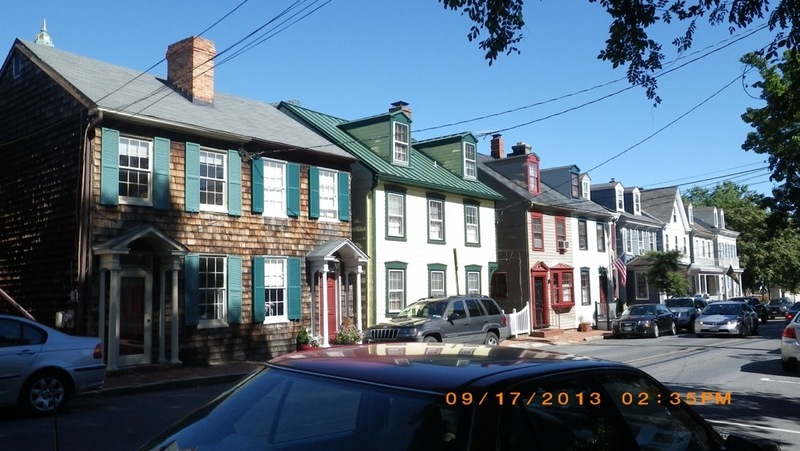 They will be staying in Annapolis a month, so I’m not sure that we will meet up with them down the road. 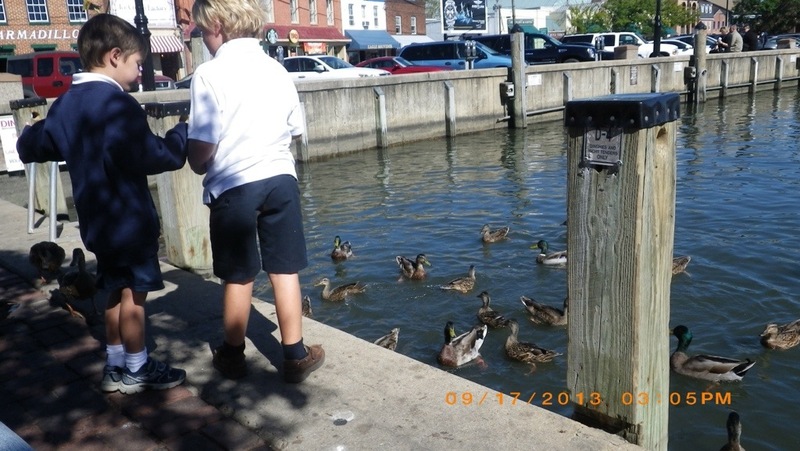 This entry was posted in 2013, Annapolis, Chesapeake Bay, Cruising Friends, Knitting, Maryland, Passages, Places Seen, United States and tagged friends, Passages, places visited. Bookmark the permalink. 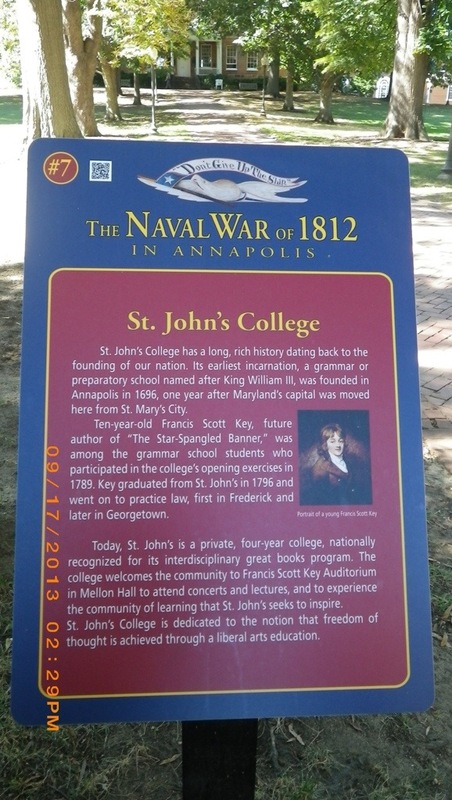 Happy you were able visit Annapolis. My sister Rose lives a bit south of there in Chesapeake Bch. Her family is there but she’s actually in Afghanistan til the end of the year. St. Michael’s will be beautiful too. Hope she stays safe there. Will look on the map. St. Michaels was beautiful and I would recommend the Maritime Museum too.